Open living and dining space with refinished oak floors and a big front window. The front door leads into the open living and dining space with a fireplace and lots of light. 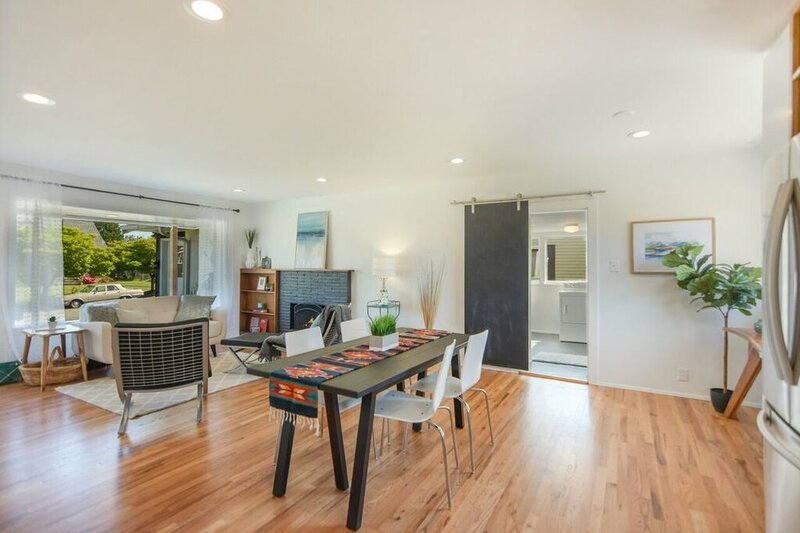 Open, single-level living defines this bright North Tacoma rambler with a big backyard. Updated kitchen with stylish hex tile backsplash and stainless appliances flows seamlessly into the living and dining space with beautiful oak floors, a huge front window, built-ins, and a fireplace. You'll love the renovated bathroom, fresh exterior paint, and retro charm. All this set in a fantastic central location on a cozy residential street between two of Tacoma’s best shopping and dining districts: 6th Ave and Proctor! You'll start enjoying this house before you even open the door. A paved path slopes gently from the sidewalk alongside beds of strawberries, blossoming chives, bleeding hearts, and rhododendron ending at the front porch (which, by the way, has one of those classic stained wood ceilings). Enter into the light, bright, open living space lit by a huge front window. 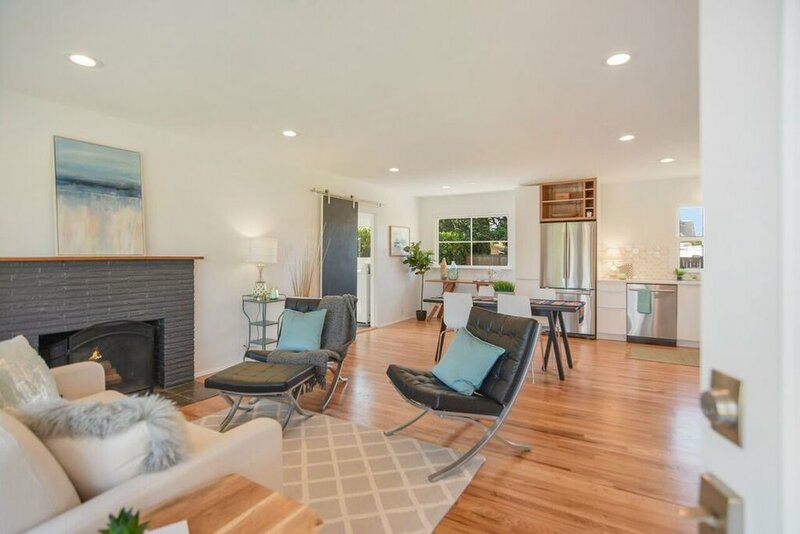 This is the heart of the home where the living room and dining room flow seamlessly into the renovated kitchen all with beautifully refinished oak floors underfoot. It's all light in this open, airy, living room with its built-in bookshelf, fireplace, and mantle. A fireplace and built-ins keep the living room cozy, while stainless appliances and stylish hexagonal tiles make a modern statement in the airy kitchen. The dining area flows seamlessly into a bright renovated kitchen overlooking the back yard. Stainless steel appliances, oak floors, and hex tiles blend retro style and modern finishes nicely. The updated full bath just outside the bedrooms features subway tile and dark gray floor tiles. The three hardwood floor bedrooms are tucked at the west end of the house near the fresh, remodeled bathroom with white subway tiles in the shower/bath, and large, dark gray square tile flooring for contrast. 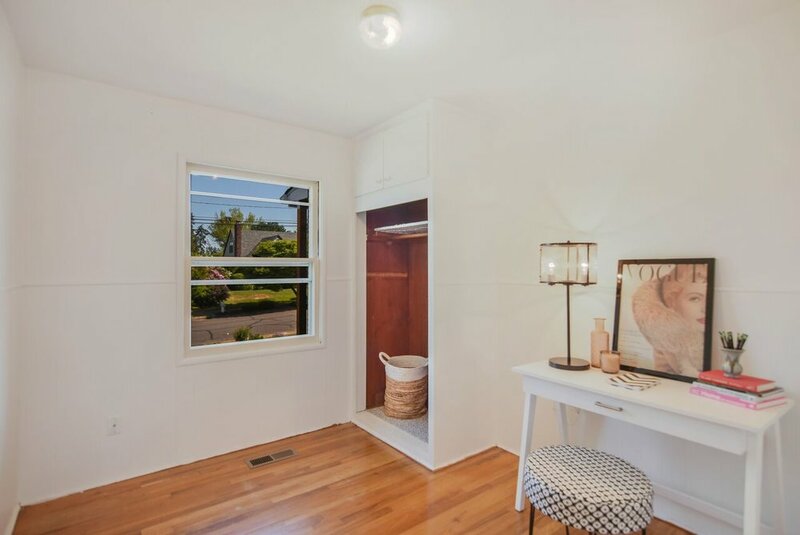 1 of 3 bedrooms at the west end of the home with oak floors and a window to the back. 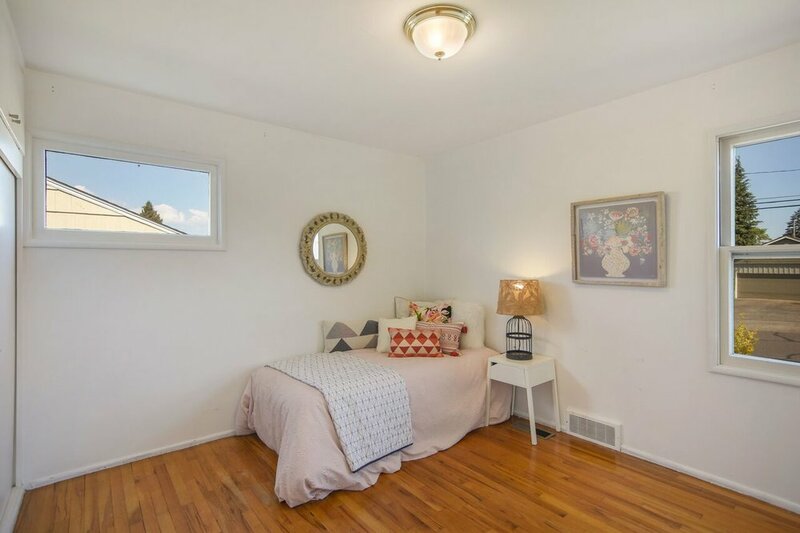 2nd of 3 bedrooms with oak floors, window light, and a nice amount of space. 3rd bedroom with oak floors and a window overlooking the front yard. Off the open living space, a chalkboard barn door opens to a convenient laundry room. From the laundry room head into the attached single car garage or step out to the patio through a back door. Don't miss that chalkboard barn door leading to the laundry room! A well lit laundry room with a small counter and sink opens into the garage and has a back door to the patio. I'll be hosting an open house Saturday, May 26th from 10 am-1 pm and I'd love to see you. In the meantime, for more information about this North Tacoma home, call or text me at 253-226-2787. I'll be happy to answer your questions about this house or the Tacoma real estate market in general. One more look at that beautiful kitchen!